The death last year of Dutch soccer player Johan Cruyff inspired numerous internet postings displaying his brilliance on the field. Among these were clips of the “Cruyff turn,” which was first performed in the twenty-third minute of the match between Holland and Sweden in the group play stage of the 1974 World Cup. Deep in Sweden’s territory, Cruyff received a pass that drew the attention of defender Jan Olsson, who quickly closed off opportunities for Cruyff to pass or attempt a shot on goal. Apparently stymied, Cruyff turned as if to retreat, but then abruptly pivoted over the ball and reversed direction. Olsson, meanwhile, had followed the feint, and inadvertently opened a gap through which Cruyff played the ball to teammates in front of the goal. Although it did not lead directly to a score, the innovative move, now a staple of soccer training, achieved a victory at the tactical heart of soccer: the contest to create and control space. Soccer is all about making space and coming into space. It is a kind of architecture on the field. In Total Football, Dutch soccer players assumed multiple roles to better exploit the full expanse of the pitch with a fluid passing game that stretched opponents’ defenses while remaining responsive to counter attacks. In his conversations with players and coaches, Winner was struck by the extent to which they viewed the game in spatial terms. “It is all about making space and coming into space,” recalled Barry Hulshoff, a veteran of Ajax Amsterdam. “It is a kind of architecture on the field. It is about movement but still it is about space, about organizing space.” 2 Winner interpreted such language as an expression of the Dutch appreciation of space inspired by the country’s landscape and its precarious relationship to the sea. Athletes devise creative responses to the constraints of the setting and the actions of teammates and opponents. In that spirit, I’ve found myself thinking more about spatial practice in sports. There are in fact many things that draw us fans to sporting events. There’s the potential for mayhem. The camaraderie of rooting for the home team. The dramatic tension of competition: golfers matching each other shot for shot in a championship tournament; a tied score in the late minutes of a soccer match; a pitching duel in baseball. All contribute to making the games not only athletic contests but also aesthetic experiences — experiences which I would argue are best understood in terms of spatial elements. The spatial practices of sports involve two interrelated factors: the frame and the performance. The frame is the physical arrangement of the playing field: the expanse of a golf course, the confines of a squash court, etc. The performance consists of the dynamics of play: fencers’ feints to gain an advantage measured in the fractions of an inch, baseball players compressing the infield to cover a bunted ball, football players expanding the gridiron with a spread offense. Not to mention the alchemical creation of open space by a Johan Cruyff in soccer or a Michael Jordan in basketball. Whether the manicured grass of a championship stadium or a patch of schoolyard, fields of play are laboratories of spatial invention in which athletes devise and spectators witness creative responses to the constraints of the setting and the actions of teammates and opponents. The settings for most modern sports have well-defined boundaries; they contain features regulating aspects of play, such as the tee box in golf or the penalty area in soccer. Most sports histories tend to describe gradual change from informality and improvisation to specificity and standardization. Certainly this is true of sports which grew from traditional practices, such as lacrosse, a Native American game transformed by Europeans and codified in the 1860s by the Canadian dentist William George Beers. But it is also often the case with invented sports. James Naismith’s original rules of basketball, published in 1892, say nothing about the court apart from mentioning that the goal is a basket and recognizing that a ball can go out of bounds. The lack of specificity allowed the early game to be adapted to gymnasiums of various sizes. Court dimensions began to be standardized only in the 1920s. The dimensional precision of modern basketball courts and other playing fields might suggest a principled, underlying logic, but the numbers can mask haphazard origins. In Squash: A History of the Game, James Zug places the rise of squash as a distinct sport at the Harrow School, in Greater London. There it emerged, in the 1860s, from a game played in the school’s irregularly shaped courtyards by younger students who sought to develop skills necessary to compete in the upperclassmen’s sport of rackets, and it soon gained popularity in Great Britain and North America alongside rackets and the variant games of squash tennis and fives (a version of handball). Early squash courts were usually shoehorned into the attics and basements of existing buildings, or constructed alongside other indoor courts, and builders experimented with court dimensions; but by the 1920s, the sport’s governing bodies sought to standardize them. In the U.K., the Tennis, Racquets and Fives Association based its dimensions on the courts of the much-admired Bath Club in London, built in 1922, which happened to measure 32 feet long by 21 feet wide. Meanwhile, across the Atlantic, the American version of the game was usually played on narrower courts measuring 16 to 18 feet wide, until, in 1924, the U.S. Squash Racquets Association adopted the dimensions of 32 feet by 18 ½ feet. It was not until 70 years later that the American and British modes of play were finally reconciled with the former British model as the international standard. Today, the ideal of the modern squash court as a consistent, neutral frame is exemplified by the portable, glass-walled courts used for high-level competitions. These have a strong presence as objects demarking the court from its surroundings, even as the transparency of the glass lends an ethereal quality to the players’ movements within the ordered space. Not all sports require absolute uniformity in their playing fields. Some allow and even celebrate degrees of variation. All baseball parks consist of the diamond (a square, technically) in which the locations and dimensions of the bases, pitcher’s mound, batter’s boxes, and other features are strictly standardized, and the outfield, for which Major League Baseball specifies only minimum dimensions (325 feet along the first base and third base lines and 400 feet from home plate to center field for stadiums built after 1958). This flexibility has allowed for the design of asymmetrical outfields that accommodate property boundaries, such as Boston’s Lansdowne Street — famously, the cause of Fenway Park’s shallow left field and the wall known as the Green Monster. Some outfields have incorporated obstacles within the field of play. Old Yankee Stadium’s monuments to deceased players and managers were in bounds in deep centerfield until 1975. Minute Maid Park, the home of the Houston Astros, had until this season a flagpole and a steep, 30-degree incline known as Tal’s Hill just inside the center field fence. An even greater anomaly, which lasted from 1928 to 1974, was Billy Goat Hill in Clark Field at the University of Texas at Austin, where the Longhorn’s knowledge of the “goat paths” up the rocky outcropping in right and center field made for a distinct home-field advantage. Within the smartly delineated boundaries of the base paths and outfield, baseball employs yet another spatial frame, unmarked by chalk or paint, that takes form whenever the batter steps into the batter’s box: the strike zone. In Major League Baseball, the zone extends from the midpoint between the top of the shoulders and the top of the pants to the hollow beneath the kneecap, as determined by the stance of the batter prepared to swing at a pitched ball. Baseball employs a spatial frame that takes form whenever the batter steps into the batter’s box: the strike zone. The range of variation among baseball fields might be noteworthy to the game’s adherents, but it is slight compared to that golf courses, which are celebrated for their idiosyncratic features. Historians traditionally situate the origins of golf in Scotland, where the first documented mention of the game appears in a 1457 act of Parliament that banned it as frivolous. The sandy, rolling linksland of eastern Scotland, which drains well and has little agricultural value, offered suitable sites for early courses such as St. Andrews, where the game has been played for hundreds of years. The notion of the golf course as an appropriation of the natural landscape continues to inspire contemporary designers. Erin Hills Golf Course, opened in 2006 and this year the site of the U.S. Open, derives its character from the rolling drumlins, eskers, and kettles of eastern Wisconsin’s Kettle Moraine region. As part of that “art and science,” golf course architects create puzzles for which the finding of solutions is complicated by variables such as wind on the flight of balls and humidity on the slickness of the greens. And there are different approaches, or schools, for constructing the puzzle for a particular hole. Three of the most common are the penal, strategic, and heroic schools. A penal hole presents an optimal path from tee to green and penalizes errant shots with bunkers, water features, and hazards. A strategic hole, in contrast, presents the player with a sequence of choices of varying degrees of safety and risk. Heroic holes are an offshoot of the strategic approach; they require the golfer either to loft the ball over an imposing hazard in order to gain simplified access to the green or else to take a safer but longer route. The 18th hole along the Pacific Ocean at the Pebble Beach Golf Links, on the Monterey Peninsula in California, is an iconic example of heroic school design. The player may attempt to drive the ball over a stretch of ocean to obtain a more favorable angle to the green or play it safe by choosing the longer inland route. Well-designed courses include a mix of hole types to give variety to the flow of the game. Whether a squash court, or golf course, or major league stadium, an empty playing field is always anticipatory, awaiting the athlete’s performance. 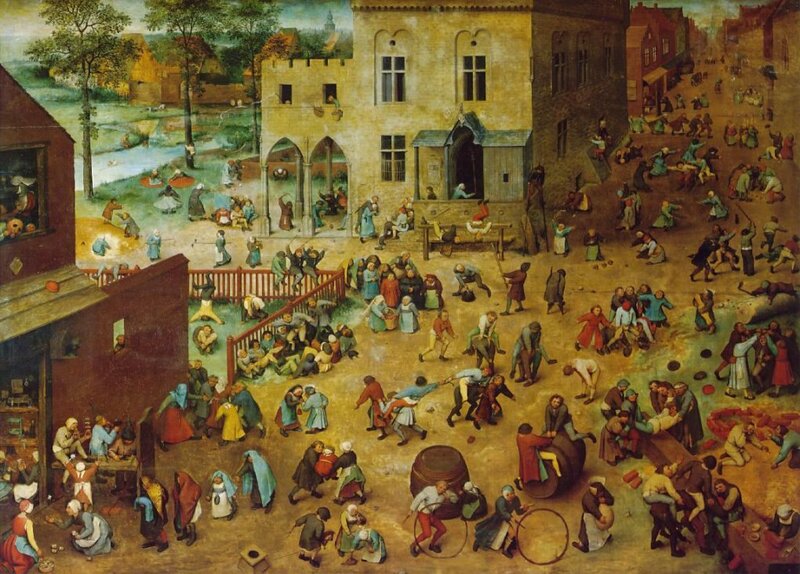 Pieter Bruegel the Elder, Children’s Games, 1560. Three blows of a stick — the brigadier — struck on the stage floor have traditionally signaled the beginning of a theater performance in France. From this point on, time, space, and action are defined by the dramatist and actors. A similar sort of transition from the ordinary to the extraordinary occurs in sports, marked by gestures such as the nod of a ball handler checking up in a half-court basketball game or by rituals such as the singing of national anthems or the performance of Maori haka by the New Zealand All Blacks rugby team. With these actions, the playing field becomes a social space, a magic circle within which the laws of the game may permit behaviors forbidden in daily conduct — body checking, allowable in the hockey rink, is discouraged in the supermarket — and also impose different measures of time. Duration in baseball is a matter of outs and innings rather than hours, minutes, and seconds, and in theory a game locked in a tie might never end (some will argue they have endured such games). When the contest is over, the bounds of the magic circle dissolve, and the rules of ordinary behavior resume. Some sports ritualize this transition with post-competition handshake lines where opponents who’d seemingly been intent on dismembering each other make at least a token effort to acknowledge the conclusion of the competition, for now. The lines Angell describes follow the structure of the field of play that is anchored by the fixed positions of pitcher and batter, and by the strike zone. Geometric patterns can also be found in sports with less prescriptive settings. Soccer play flows freely across the rectangular pitch, which has few features that regulate the positioning of players; but as the match proceeds, players might create chains of triangles and trapezoids that facilitate or foreclose opportunities for advancing the ball. Today’s famous patterns are the products of spatial invention, like the Cruyff turn, developed to gain advantage over opponents. Although the object of the game, the configuration of the pitch, and the fundamental rules have remained relatively consistent throughout its history as a modern sport, the spatial performance of soccer has changed dramatically. Scottish teams of that era approached the game differently by advancing the ball with short passes along the ground as well as dribbling it. Such “combination play” allowed team members to spread out over more of the field and to move the ball with greater speed. Passing and receiving techniques quickly developed to include lofting the ball in the air, trapping it with the chest, and directing it with the head. A glimpse of the future of the passing game was seen in 1872, at soccer’s first international match, when Scotland, despite fielding smaller players, held favored England to a draw by passing the ball around their opponents rather than trying to run through them. And as the passing game gained favor, teams adopted new alignments that reduced the number of players in the front line in order to cover more of the field. The resulting formation of two deep-lying defensive players, three midfield players, and five attackers on the front line, known as the 2-3-5, or pyramid, was being widely used in the early 20th century. The game as they saw it was about space and how you controlled it: make the pitch big when you have the ball, small when you do not. After soccer’s formative years, the most significant rule change was the 1925 revision to the offside rule that made it easier for offenses to initiate attacks deep in their opponents’ territory. This in turn required new deployments of defenders, and Herbert Chapman, the manager of London’s Arsenal club, devised a response that became particularly influential. He strengthened the defensive line and expanded the distribution of midfield players in a formation described as 3-2-2-3, or the W-M, which refers to the diagrammatic pattern of the players on the field. The alignment facilitated a mode of play characterized by midfielders quickly falling back and regaining possession of the ball on defense, and then transitioning to a counterattack with speed and precise passing. In later years, as the game evolved from the 1930s to the turn of the 20th century, important tactical innovations originated far beyond Great Britain, in Continental Europe and Latin America. One of the most notable was the Swiss manager Karl Rappan’s practice, in the 1930s, of assigning a defender to cover a particular area of the field (zone defense) rather than a specific opponent (man-to-man defense). In addition to envisioning the field of play spatially, as a set of zones, tactical innovators developed ways of manipulating players’ perceptions of space. In his history of soccer tactics, Inverting the Pyramid, Jonathan Wilson describes parallel mid-20th-century inventions by team managers Valeriy Lobanovskyi, in Ukraine, and Rinus Michels, in Holland: “The game as they saw it was about space and how you controlled it: make the pitch big when you have the ball and it is easy to retain it; make it small when you do not and it becomes far more difficult for the opposition to keep it.” 12 In practice, this means players on offense expand the field by positioning themselves, often in triangular groupings, to be able to move the ball around the entire field. On defense, they shrink the field by converging on the ball handler and limiting passing opportunities. These principles are fundamental to players and coaches today. American football has a similar history of spatial innovation that changed the game from one in which players advanced the ball en masse to the more wide-open play of today. The core features of football — the gridiron, eleven players on a side, play proceeding incrementally to achieve a prescribed distance within a set number of attempts (downs) — were codified by Walter Camp in the 1880s. Signature plays of that era included the infamous flying wedge — a ball carrier surrounded by all his teammates running at full speed over a hapless defender. First inflicted by Harvard upon Yale in 1892, the play was prohibited for safety reasons two years later, though clearly the smashmouth spirit it embodied remains popular. The forward pass was legalized in 1906, partly as a way of reducing injuries (and deaths) from mass plays like the flying wedge. Its widespread acceptance, however, was gradual, even after Notre Dame’s quarterback Charles “Gus” Dorais surprised Army in 1913 by throwing a 40-yard touchdown pass caught in full stride by Knute Rockne. In both soccer and American football, spatial innovators changed the game from one in which players advanced the ball en masse to the more wide-open play of today. S.C. Gwynne recounts the spatial transformation of football into a passing game in The Perfect Pass: American Genius and the Reinvention of Football. He focuses on the career of coach Hal Mumme, currently at Belhaven University in Jackson, Mississippi, who is one of the strongest proponents of the “air raid” offense that upends the running game of smashmouth football with a pass-first approach. While coaching high school and college teams in the 1980s and ’90s, Mumme built on the work of other inventive coaches to devise an easily taught approach that would open up the field for receivers and thus confuse defenders. Considered in terms of play diagrams, or viewed from the upper deck of a stadium, or watched on video from the Goodyear blimp, spatial performance can seem abstracted into patterns and geometry. But on the playing field it is experienced as measurable and immediate, and as a matter of shifting perceptions. A football player using the yard lines to measure a pass route or a squash player contesting his opponent to occupy the “T” (the spot midway along the line at the end of the service box) for optimal position are examples of precise spatial performances. In contrast, shifting perceptions have more to do with appearance than with measure. The dimensions of the football gridiron and soccer pitch do not change during a game, but as we’ve seen, they can be made to seem larger or smaller. Within the measured setting delimited by the painted lines of the court, the spell of the magic circle invoked at the starting tip-off creates an ephemeral space governed by the laws of the game and activated by the players’ performance — a space that transcends our ordinary perception of time and space. Woodbine describes a moment during a streetball tournament in Boston when a player leapt off the pavement five feet in front of the rim while holding the ball in his outstretched hand. The nature of sports — as competition and as quest for perfection — allows athletes to find fulfillment without witnesses; but as Woodbine reminds us, the magic circle enveloping players can have a powerful attraction for spectators. The summer streetball tournaments Woodbine studied, played on the public courts in Boston’s inner-city neighborhoods, place the game within a broader mission of community building and healing. At events such as the Save R Streets Basketball Classic and the Russell Paulding Community Awareness Tournament, held in Roxbury, the mostly black players and spectators come together not only to enjoy the competition and the festive spectacle but also to remember victims of drugs and violence. Woodbine describes this physical and social space as a series of concentric rings loosely surrounding the court. The outermost ring is the realm of gang members and hustlers. The middle ring is for casual fans and families, and for players between games. The innermost ring, closest to the court, is where older women set up lawn chairs and the elders of the game intently observe and comment on the game. “Street ball is rhythm and flow,” Woodbine writes, “and during its peak moments, the three rings of the asphalt collapse into a singular band, every head and toe pressed against the sidelines, caught up in the spectacle.” 18 Such moments are about more than athletic brilliance. Drawing on his own experiences as a player on Roxbury’s courts as well as on ethnographic studies, Woodbine views street basketball in inner-city black communities as a form of lived religion. The court and the rules of the game frame both the ritualistically familiar and the spontaneous actions of the players. Through their spatial performance, the athletes become embodiments of the sacred, inspiring moments of transcendent joy in the community. Streetball courts and their counterparts — playground soccer pitches, rural baseball diamonds, backyard hockey rinks — may not bedazzle the eye like a storied collegiate or professional stadium, but they too are sites of multivalent spatial practices. Each begins with a physical frame, scratched in the dirt or elaborately defined, transformed under the spell of the magic circle (architects might describe it as becoming a “place”). As players tactically exploit the inherent spatial properties of the court or field, they focus on the game and strive to achieve heightened awareness of its dynamic qualities of space and time. The technical jargon, the mysterious X’s and O’s drawn on coaches’ chalkboards, not to mention the commercial and behavioral excesses of the sports-entertainment complex — all these can obscure our appreciation of the spatial practices of sports. They can obscure as well our understanding of the natural connections of sports to other spatial endeavors, like dance and architecture. In Art and Engagement, the philosopher Arnold Berleant argues that “A dance performance is not a display of objects moving in empty space but an array of conscious human bodies moving in a field of forces, forces which they create and to which they respond.” 19 (Merleau-Ponty’s soccer player is hovering somewhere in the background.) Surely Louis Kahn’s oft-quoted declaration that “architecture is the thoughtful making of spaces” speaks also to the designed gaps and separations in Hal Mumme’s “mesh” formation. The ESPN addict, the ballet lover, and the architect have a lot to talk about. Hermann Hertzberger, Lessons for Students in Architecture, 4th ed. (Rotterdam: 010 Publishers, 201), 149; quoted in David Winner, Brilliant Orange: The Neurotic Genius of Dutch Soccer (Woodstock, NY: Overlook Press, 2002), 29. George F. Will, Men at Work: The Craft of Baseball (New York, Macmillan, 1990), 243. H. N. Wethered and T. Simpson, The Architectural Side of Golf (London: Longmans, Green & Co., 1929), 2. Ben Crenshaw, forward to Tom Doak, The Anatomy of a Golf Course (New York: Lyons & Burford, 1992), xii. Michael Novak, The Joy of Sports: End Zones, Bases, Baskets, Balls, and the Consecration of the American Spirit (Lanham, MD: Hamilton Press, 1967), 123. Johan Huizanga, Homo Ludens: A Study of the Play-Element in Culture (London: Routledge & Kegan Paul, 1949), 9-10; Bernard Tschumi, O. Khan, D. Hannah, “Performance / Architecture: An Interview with Bernard Tschumi,” Journal of Architectural Education 61, no. 4 (2008): 52-58, http://doi.org/bcdswr. Roger Angell, The Summer Game (New York: Viking, 1972), 302-303. David Goldblatt, The Ball Is Round: A Global History of Football (New York: Riverhead Books, 2008), 36. Jonathan Wilson, Inverting the Pyramid: A History of Football Tactics (London: Orion, 2008), 218. S. C. Gwynne, The Perfect Pass: American Genius and the Reinvention of Football (New York: Scribner, 2016), 105. Maurice Merleau-Ponty, The Structure of Behavior. Translated by Alden L. Fisher (Boston: Beacon Press, 1963), 168-169. See also, John Hughson and David Inglis, “Inside the Beautiful Game: Towards a Merleau-Pontian Phenomenology of Soccer Play,” Journal of the Philosophy of Sport 29 (2002): 1-15, http://doi.org/b99q. Hans Ulrich Gumbrecht, In Praise of Athletic Beauty (Cambridge, MA: Harvard University Press, 2006), 198. Onaje X. O. Woodbine, Black Gods of the Asphalt: Religion, Hip-Hop, and Street Basketball (New York: Columbia University Press, 2016), 198. Arnold Berleant, Art and Engagement (Philadelphia: Temple University Press, 1991), 164. Introduction by Simon Sadler. Archival Text by Charles Moore. Half a century ago Charles Moore was a rising architect and Ivy League academic. He was also the first in the field to look seriously at Disneyland — and he liked what he saw. Why not make buildings today as they once were made? This is actually a really good, really radical question. 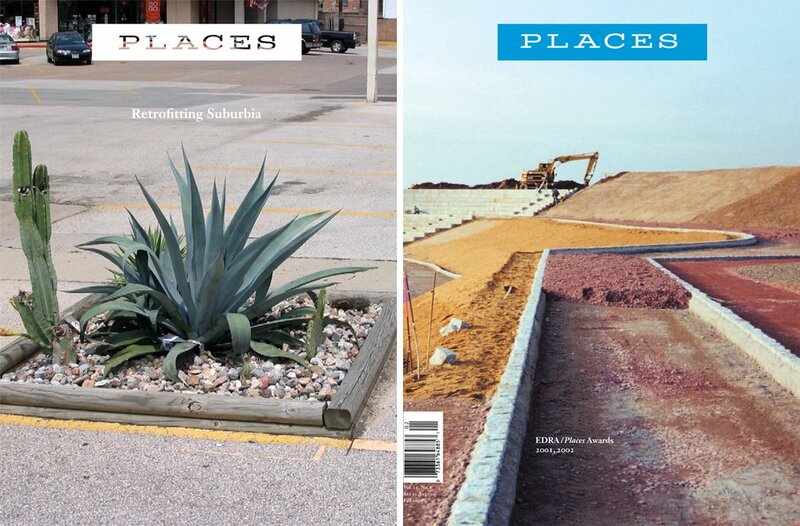 Richard Cleary is a professor of architectural history at the University of Texas at Austin.